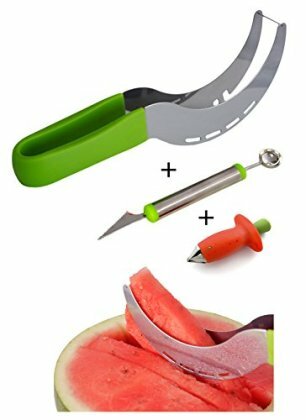 3 PCs Tool Kit: ★ Extra Large Stainless Steel Watermelon Slicer ★ Strawberry Huller Stem Remover ★ Large Melon Baller with Carving Knife. ★THE-BEST-VALUE-BUNDLE★ 3 Tools In 1 Kit Include: [Watermelon Slicer] + [Strawberry Huller] + [Melon Baller]. Your Search For Watermelon Slicer, Strawberry Huller, Or Melon Baller Is Finally Over. ★LARGEST WATERMELON SLICER★ Get Freshly and Perfectly Sliced Watermelon In Seconds Without Mess Since Watermelon Juice Stays Inside Watermelon. This Watermelon Lovers' Best Friend Is Built To Last With Professional Grade 304 Stainless Steel. Great Time-Saver In Your Kitchen. ★COMFORTABLE AND NON-SLIP HANDLE★ This Coated Handle Won't Slip; Won't Hurt Your Hand (Unlike Other All-Metal-Handles). ★SAVE MORE TIME★ Making Stuffed Strawberries, Strawberry Smoothie, Strawberry Jam. Strawberry Huller Stem Remover Removes Stems In Seconds. Super Easy To Use. 10X Faster Than Traditional Method. ★100% SATISFACTION GUARANTEE★ Your Complete Satisfaction Is Our Ultimate Goal. Love It or Your Money Back.